Cytokine Effector Functions in Tissues discusses the cytokines networks in the context of the specific-tissue environment. It is an up-to-date collection of articles that addresses the specific issue of how the cytokines are able to condition tissue specific homeostasis. 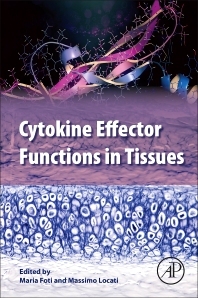 The book helps the reader understand how cytokines network inside the tissues and highlights whether tissue-protection or exacerbation will be finally controlled. It describes the cytokines detected and regulated in different tissues, such as the brain, lungs, spleen, liver, pancreas and intestine, also addressing the issue of timing in specific cell types. Maria Foti is Assistant Professor at the University of Milano-Bicocca. She is an internationally recognized immunologist/molecular biologist with experience in both academic science and biotechnology. She has worked for several years in the field of molecular immunology and cell biology of Dendritic Cells. She studied the molecular events associated with Dendritic cell early responses, suggesting the role of Dendritic Cells as the key players in the innate immune responses. Dr. Foti's lab has a focus on cytokine research including the role of cytokines produced by Dendritic cells in response to pathogens. She has been also involved in projects for the selection of biomarkers using the microarray technology in the field of cancer and Autoimmunity. Massimo Locati is Full Professor of General Pathology and Immunology at the Department of Medical Biotechnologies and Translational Medicine at the University of Milan and chief of the Leukocyte Biology Lab at the Humanitas Clinical and Research Center in Rozzano, Milan. His current scientific research interests are represented by cellular and molecular mechanisms involved in resolution of inflammation, identification of the biological role of chemokine decoy receptors, definition of chemokine receptors signalling properties and associated transcriptional events investigation of molecular mechanisms supporting macrophage activation and polarization, and role of regulatory RNA in innate immunity and immune- mediated diseases .